I'm back. I have returned to the lovely beach city of Cannes, located in the South of France, for another two weeks of cinema mania. Kicking off today is the 67th Cannes Film Festival; this will be my sixth time here, I'm a regular now. I know every street, every cafe and all the secret ways to sneak into movies and snag the best wifi. However, this year I'm going to be mirroring my own thoughts/coverage with those of the late Roger Ebert. 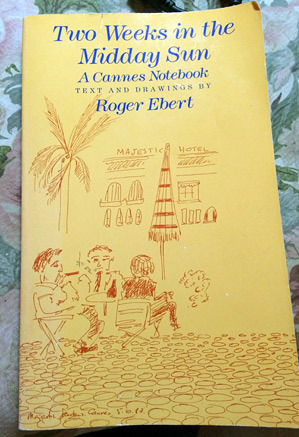 Ebert used to attend Cannes every year, and during his trip in 1987 he started sketching and taking notes and wrote a book titled Two Weeks in the Midday Sun (now out-of-print and hard to find). Earlier this year, my girlfriend Cindi produced a worn, dog-eared copy of a yellow-covered book with "Text and Drawings by Roger Ebert" that she was reading. 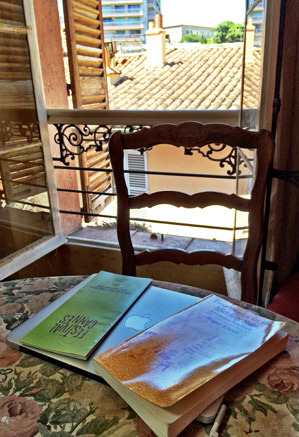 I took a closer look: Two Weeks in the Midday Sun - A Cannes Notebook is the full title. "I've never even heard of this!" I exclaimed. Every Cannes regular I've seen since, I've asked them about it - and no one else has heard of it either. Then again, it was published in 1987, the writing isn't deeply insightful (like most of his reviews) but rather playful and fun, and the sketches are rudimentary, but they are from Ebert's hand. As I started reading the first few pages, I realized - these notes were Roger Ebert blogging from Cannes way, way before blogging even existed. Ebert was ahead of his time. Here's the copy that I brought with me to Cannes (used on Amazon for $42) + my workspace in the flat. "The festival is held for two weeks every May. There is nothing else like it anywhere in the world. The 1987 festival was the fortieth anniversary year for Cannes, which was originally conceived in 1939 as a response to Mussolini's Venice Film Festival, but which finally got underway after the war. The earliest years were fairly serious affairs, the sunny Riviera notwithstanding, but in 1949 a starlet took off her bikini top and embraced Robert Mitchum for the photographers on the beach, and the Cannes Film Festival as we know it was born. It is claimed that forty thousand people attend, not counting the hot-eyed fans who surge at the barricades and scream out the names of their heroes as the stars promenade into the Palais every night. This is the movie industry's annual trade fair, serviced by three daily festival newspapers, which run lists of prominent industry figures with the names of the hotels where they are staying, and then one of two words: Buying, or Selling. Every year there are festival jokes: The pope was just shot. Oh, yeah? When are they releasing it?" Here's where things do change. Instead of just 40,000 people attending every year, that number has grown considerably, too. An infographic posted at cannesbythenumbers.com for 2014 says that the population in Cannes jumps from 73,000 to 180,000 during the fest. It grows every year, and while most of the people in town don't have badges and can't attend most screenings (even though they still try), it is still swamped with industry folk, cinephiles, critics from all over the world. Cannes is a lovely, fascinating, invigorating, challenging, exciting place to be. The love for cinema is nearly tangible, although celebrities and fame still do take center stage out on the streets. As Ebert said, "There is nothing else like it anywhere in the world." The 2014 festival officially kicks off today, and runs for two weeks until Sunday, May 25th. I'll be here the entire two weeks, right up until the end. I will often be referencing many of the quips and notes from Ebert's book, and will compare and contrast them with our own experiences. As my good friend and flatmate Eric Lavallee of IONCinema just said, we've shared so many of these same experiences and moments as he did, but didn't even know it was possible to write about them. Inspired by his prose and fun take on the festival, I get to follow in his footsteps through cinema heaven, and write about my own experiences for all to enjoy. But let's get into the films. It's always hard to guess at what will be good before the festival begins, but I can easily name the films that I'm looking forward to seeing the most: Zhang Yimou's Coming Home (see the trailer here); David Michod's The Rover (see the trailer here), his follow-up to the gritty Australian crime drama Animal Kingdom from Sundance a few years ago; Bennett Miller's long delayed real life murder story Foxcatcher; The Artist director Michel Hazanavicius' latest film that no one knows much about titled The Search; plus Ryan Gosling's directorial debut Lost River, which looks like a trip (see the first look here). As always, you can find my to-the-second updates/mini-reviews on Twitter as @firstshowing constantly throughout this year's festival. I'll also be posting reviews and updates here on the site, as well as photos on Instagram as @abillington. Last year at the start, I quoted Romanian filmmaker Cristian Mungiu from the opening press conference, and I think his quote is still the best thoughts to open a festival: "I'm waiting for a film that can re-invent things and shows us a new way of seeing a film… I'm looking for a certain kind of honesty and courage from a filmmaker. I'm looking forward to seeing films that lead us on a different path." Thanks AB for providing the excellent coverage as always. Enjoy your time in paradise.